On the night of February 24 1942, something extraordinary occurred in Los Angeles. Military forces throughout the coastal region detected a mysterious flying object or perhaps objects, approaching the city from the ocean. It had been less than three months since the Japanese attacked the United States at Pearl Harbour and U.S. military forces were therefore in a state of high wartime alert. The object was tracked as it drew closer to the coast. Fearing enemy attack, wartime measures were put into effect and a blackout was enforced across the city. Searchlights began to be trained on the mystery object. Soon, the order to fire was given. Air-defence batteries opened up in an extraordinary barrage of fire. The searchlights converged on their target as it seemingly progressed inexorably onwards, undeterred by the artillery shells detonating around it. It moved slowly. Speed estimates range from 50 to 200 mph. Some thought it was a blimp. But how then could the artillery shells have so little effect on it? Confused reports came in from all over the city. Some air defence units reported multiple aircraft; some only one; and some thought there were none at all. Eye-witnesses describe the mystery aircraft as “blob-like”, “lozenge-shaped” and glowing with a radiant red-orange colour. One woman who had a close-up view said it was the most beautiful thing she had ever seen. Interceptor planes sat waiting on the tarmac. But they were never launched. It was feared that the object, whatever it was, might herald a large-scale Japanese attack. Only a small number of interceptor aircraft were available so it was decided to hold them in reserve to deal with the anticipated larger attack later on. The air-defence barrage continued for hours before the object disappeared from view. On the next day, the streets of the city were strewn with debris from the thousands of spent shells. Six people are known to have been killed during the night's extraordinary events. They were the victims of stray shells, of heart attacks or of traffic accidents caused by the blackout. The press reported the incident the next day and some extraordinary images of converging searchlights converging over the city were printed. No one at the time talked about UFOs. The Japanese were the prime suspects. Some speculated that the aircraft might have been launched from a nearby submarine. Secretary of the Navy Knox was quoted as saying that the whole thing was a false alarm caused by “jittery nerves”. The local Air Force, however, maintained that there had indeed been anomalous aircraft in the sky that night. It was only in later years that the Battle of Los Angeles, as it came to be called, was regarded as a precursor to the UFO phenomenon. 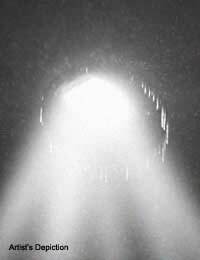 Photographs of the night's events were studied and some claimed to be able to detect a classic flying saucer shape illuminated in the searchlights' beams. The Majestic 12 documents tells of the recovery of a mystery aircraft, described as “not earthly” and “probably of interplanetary origin”, from the waters off the California coast shortly after the Battle of Los Angeles occurred. A secret military agency known as the Interplanetary Phenomenon Unit (IPU) was supposedly formed as a result. Several sources have confirmed that a military agency bearing this name did in fact exist, though nothing further about it is known for certain. The Battle of Los Angeles was extraordinary indeed. Whether you are a believer or a sceptic, whether you regard it as an extra-terrestrial show of force, in which aliens made their presence known and demonstrated the futility of us attempting to use our weapons against them; or whether you regard it as nothing but a case of mass hysteria, in which vast numbers of people imagined something which wasn't there, you can indeed see in the night's events a foreshadowing of the UFO phenomenon which was to rocket into public consciousness only a few years later.